Glass Panel inserts can give your kitchen a modern look. In its former life, these kitchen cabinet door featured a builder’s grade, solid frame of wood. Now transformed with glass inserts following a kitchen remodeling project, the door presents a beautiful, customized look for the kitchen. 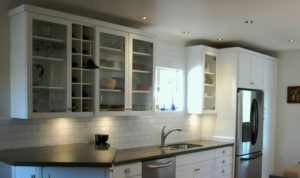 Transform the look of your kitchen cabinets by replacing wooden or fiberboard panel inserts with glass. Upgrading your kitchen or bathroom with glass-paneled cabinet doors instead of standard wood-paneled doors is an excellent way to bring elegance and aesthetic appeal to the overall style of your home. If you choose to use transparent glass panels, they may even save you time when searching for the right dish or pan in the kitchen. Woodsmyths Chicago is your go to source for glass panel replacement kitchen cabinet doors.